The PLAYMAKER CHUTE is a chute without partitions. Ideal for teaching zone and combo blocking schemes. Use it to practice the cross, trap, reach, iso and counter-trey blocks. Work half-line or full-line blocking assignments against players positioned under the chute. The screen is adjustable in height from 46" to 66". Four suspension rods control the height and angle of the screen. Measures 4' deep. Select the size based on workout groupings: 3 lineman - 16', 4 lineman - 20', 5 lineman - 24', and 6 lineman - 28' in length. New and improved screen made from reinforced I-beam grating offers added strength and durability. Standard equipment includes BLACK powder coating and a wheel package that includes 8" solid swivel wheels for optimal maneuverability. 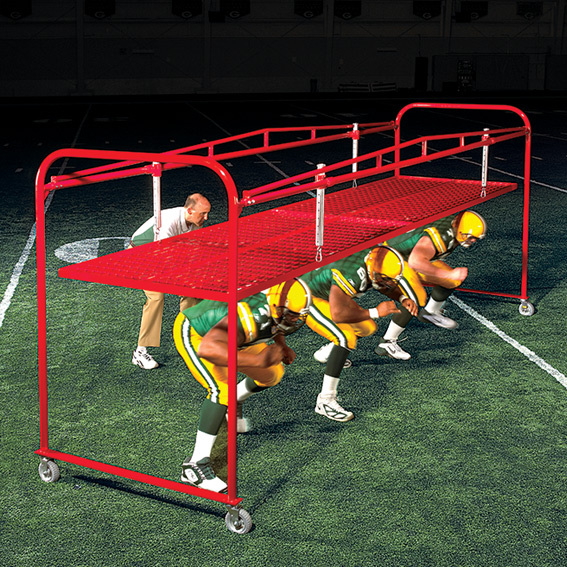 Very easy to move the Playmaker Chute from one practice location to another, or on and off the field. Made entirely of aluminum. Will never rust! "The coaching point is to maintain low pad level while executing a full range of combo blocks!" The SCREEN LINER prevents helmet scratches! Made from a non-marking PVC.